In October, employment increased for women aged 55 and older and fell among women aged 25 to 54. There was little change for the other demographic groups. Ontario, British Columbia, New Brunswick and Manitoba saw gains in employment, while Alberta recorded a decline. There was little or no change in the other provinces. In October, more people were employed in public administration, wholesale and retail trade, as well as accommodation and food services. On the other hand, employment decreased in the ‘other services’ industry, natural resources and utilities. Both the private and public sectors saw an increase in the number of employees in October, while the number of self-employed workers decreased. In October, employment increased by 44,000 for women aged 55 and older and their unemployment rate fell from 5.4% to 5.0%. Compared with 12 months earlier, employment for this group was up 92,000 (+5.8%), partly the result of growth in their population. Among men aged 55 and older, employment was little changed in October, but the unemployment rate dropped 0.7 percentage points to 5.7% as fewer of them looked for work. Employment for women aged 25 to 54 fell by 30,000 in October and their unemployment rate rose from 5.5% to 5.7%. On a year-over-year basis, employment for this group was little changed. For men aged 25 to 54, employment was little changed in October but was up 29,000 on a year-over-year basis. Compared with October 2014, their unemployment rate rose from 5.8% to 6.4%, the result of an increase in the number of people searching for work. Employment among youths aged 15 to 24 was little changed and their unemployment rate was 13.3%. In the 12 months to October, youth employment was down 45,000 (-1.8%). Over the same period, the population of this group declined by 41,000 (-0.9%). In Ontario, employment increased by 29,000 in October and the unemployment rate was 6.8%. On a year-over-year basis, employment in the province was little changed as gains in full-time work were offset by declines in part time. Employment in British Columbia rose for the second consecutive month, up 23,000 in October. The unemployment rate was unchanged at 6.3% as more people participated in the labour market. With the recent increases, year-over-year employment gains in British Columbia amounted to 67,000 or 3.0%, the highest growth rate among the provinces. In New Brunswick, 4,100 more people were employed in October. However, the unemployment rate was little changed at 9.0%, reflecting an increase in labour market participation. Employment in Manitoba rose for the third consecutive month, up 2,800 in October, bringing employment gains over the past 12 months to 7,300 (+1.2%). With more people participating in the labour market, the unemployment rate held steady at 5.3%. Manitoba now has the lowest unemployment rate in the country, as the unemployment rates for Saskatchewan and Alberta increased in recent months. Employment in Alberta fell by 11,000 in October and was little changed from 12 months earlier. 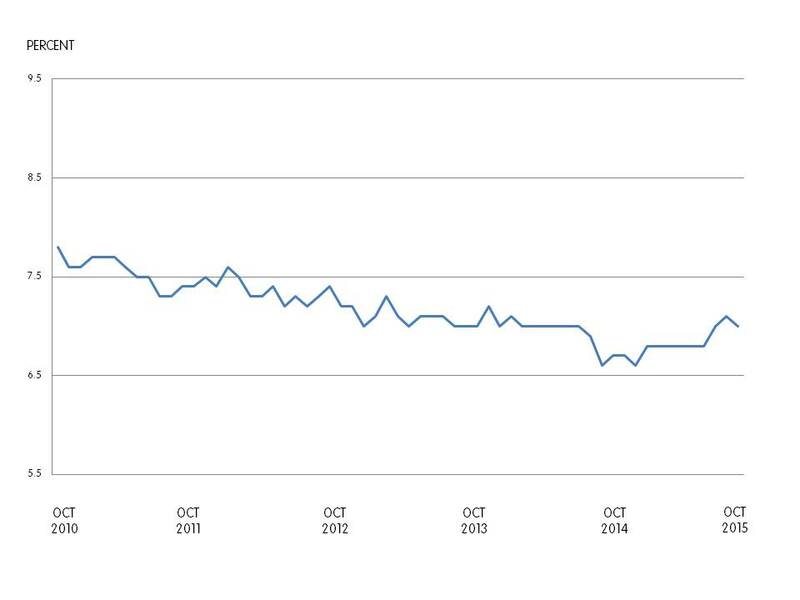 Compared with October 2014, the participation rate increased by 0.6 percentage points to 73.1%. Over the same period, the unemployment rate in the province was up 2.2 percentage points to 6.6% as more people were looking for work. In Saskatchewan, employment was virtually unchanged both in October and on a year-over-year basis. However, the unemployment rate increased by 0.5 percentage points to 5.6% in October, the result of more people searching for work. Employment in Quebec was little changed in October, and the unemployment rate remained at 7.7%. On a year-over-year basis, employment in the province was up 47,000 (+1.2%), with all of the growth in the first four months of 2015. 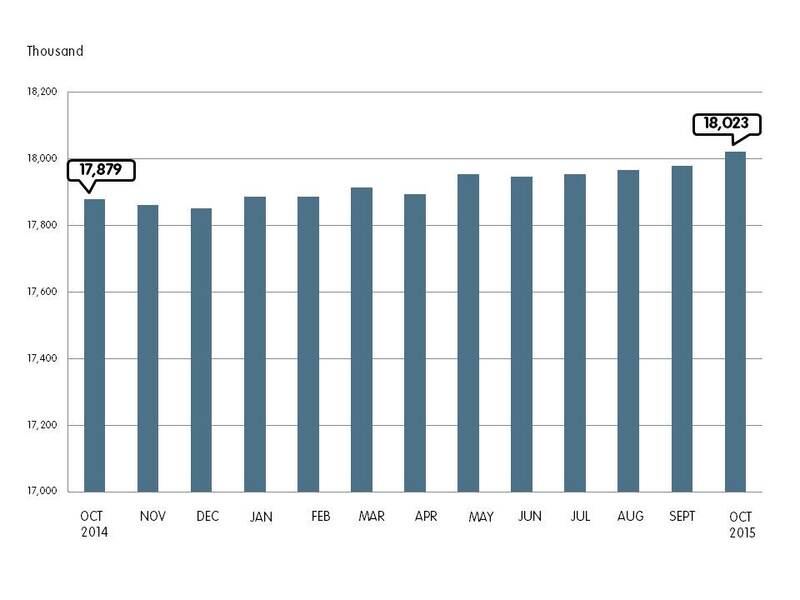 In October, employment increased by 32,000 in public administration. The increase was seen across all provinces and mostly in temporary work, coinciding with activities related to the recent federal election. Note that the Labour Force Survey reference week ran from October 11 to 17. Advanced polling took place from October 9 to the 12 and the election was held on October 19. Employment in October also increased in wholesale and retail trade, up 18,000. On a year-over-year basis, however, employment in this industry was little changed. Similarly, employment increased in accommodation and food services, up 13,000 in October, but it was little changed from 12 months earlier. There were 8,900 fewer people working in ‘other services’ such as repair and maintenance, as well as personal and laundry services. In the 12 months to October, employment in this industry was down by 13,000 (-1.6%). Employment in natural resources continued on the downward trend that began a year ago, falling by 8,000 in October and bringing total losses in the industry to 26,000 (-6.9%) over the past 12 months. Most of the declines were in Alberta. In October, the number of employees increased by 41,000 in the private sector, and by 31,000 in the public sector. On the other hand, the number of self-employed workers was down 27,000. Compared with 12 months earlier, the number of public sector employees was up 97,000 (+2.7%), while private sector employment was little changed. Self-employment was also little changed.